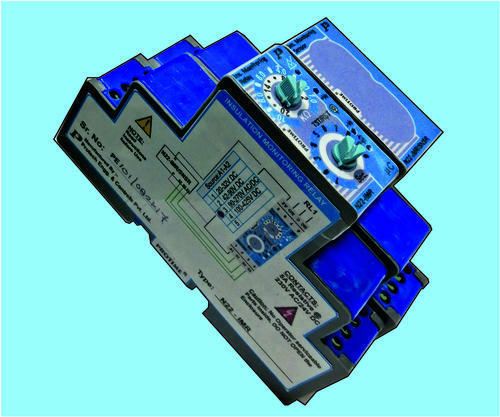 Pioneers in the industry, we offer dc earth leakage relays (insulation monitoring relays) from India. DC Earth Leakage Relays offered by us works on the principle of sensing the leakage current through Resistor Bridge. It senses the DC Earth leakage current for any equipment like switch boards, rectifiers, and battery chargers by sensing resistance between Positive-Negative terminals of DC system & earth. The lower resistance results in the loss of life or damage to equipment. 90-270V AC/DC or 12 / 24V/48V DC. 6A resistive at 24V DC or 240V AC. ±5 % of Full Scale. On any standard mounting channel. 77mm(W) X 90mm(H) X 110mm(D). Looking for “DC SYSTEM Protection Relays”?